Virtual workshops… real social change. Working for Campaign Consultation, Inc. as a TA (Technical Assistant) Provider for AmeriCorps VISTA (Volunteer In Service To America) I produce a monthly online “webshop” to teach VISTAs how to use various Social Media tools in their service or for their organization. 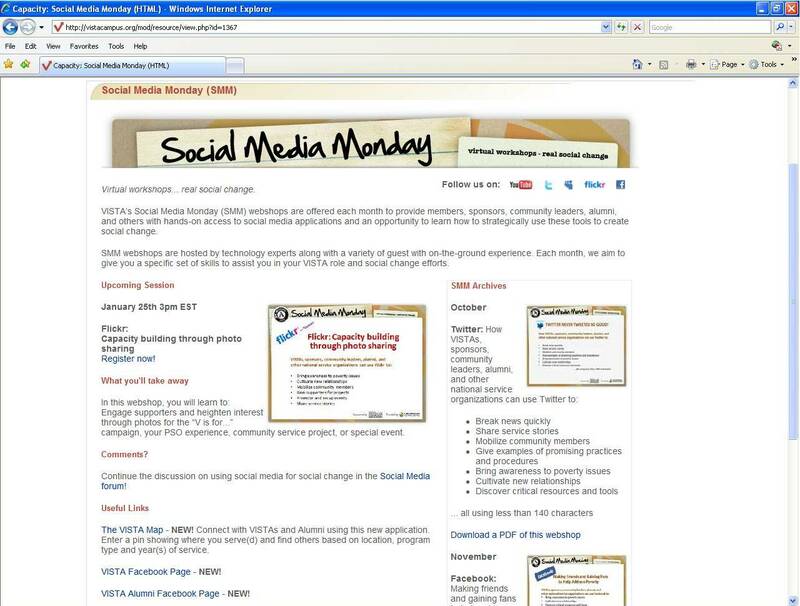 Social Media Monday (SMM) webshops are offered each month to provide members, sponsors, community leaders, alumni, and others with hands-on access to social media applications and an opportunity to learn how to strategically use these tools to create social change. In addition to lending my technology expertise, I book a variety of guest with on-the-ground experience. Each month, we aim to give VISTAs a specific set of skills to assist them in their role and in their social change efforts. Want to learn more about our Social Media Monday webshops? Visit the VISTA Campus and login as a guest to see archives of past webshops and to see what is coming up in the months ahead. I can’t belive that you created all of the job to share this! Awesome. With out Bloggers like you, we would by no means get so great information’s!